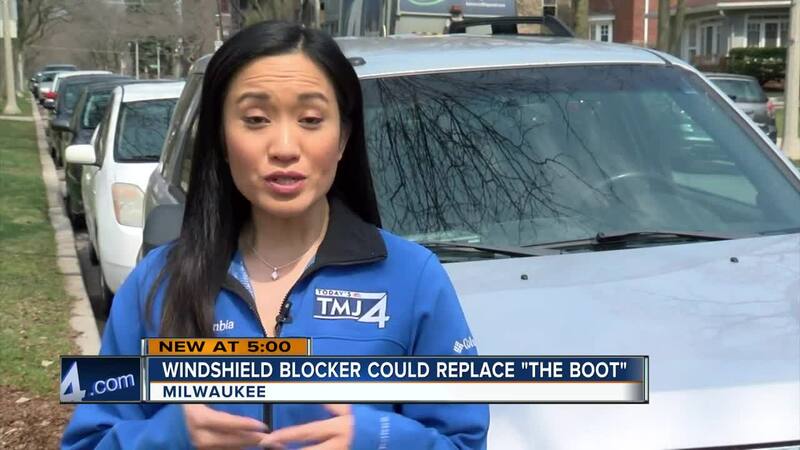 Windshield blocker could replace "The Boot"
MILWAUKEE — A new tool in the battle against repeat parking violators heads to Gov. Tony Evers' desk. Last week, the House and Senate passed an amendment expanding current state law to include windshield blockers as a parking enforcement tool. Cities and college campuses use one from a company called The Barnacle. Unlike the parking boot that goes on a tire, The Barnacle is a bright yellow device that suctions onto your windshield. It has a tamper alert and can be tracked by GPS if driven away. Drivers must pay a fine for an access code to remove it. "I guess if you can't see out your car you can't drive," said Milwaukee resident Brooke Magnus. Milwaukee does not have a booting ordinance. State hearing materials show the city supports expanding parking enforcement to include devices such as The Barnacle. Wisconsin state lawmakers who support the windshield blocker said the new technology is cost effective, convenient and safer to install. In Stuart, Florida, drivers with five or more unpaid parking tickets may get The Barnacle. According to the company website, customers include Las Vegas, Columbia and Asheville. Currently in Milwaukee, if drivers fail to pay parking tickets the state can recoup the money through your tax refund. Cars with three or more parking citations older than 30 days may be towed. Local drivers were mixed on The Barnacle. "It's just another way of punishing people who already probably can't pay," said Magnus. "If somebody comes and sees that on their windshield I think they'll call and get it taken off faster than they would if they get their car ticketed," said Milwaukee resident Tina Ball. "Seems like more of a pain in the neck than the boots on the tires," said John Brice. "That's a dumb idea. Somebody's just trying to sell something to make some money, for sure," said Matthew Barnard. We reached out to the Milwaukee Mayor's Office for comment but did not hear back.